The difference between webbed toes and distinct digits may result from how genes regulate genetic information. Researchers at the National Institute of Genetics, Research Organization of Information and Systems (ROIS) in Japan found that a small, non-specific tweak to a mammal's DNA can potentially cause specific physical changes. The scientists recently published the results of their study in the Proceedings of the National Academy of Sciences. "We aim to illustrate that a change in regulatory information of a certain gene definitely triggers change of limb shape," said Toshihiko Shiroishi, a professor in the Mammalian Genetic Laboratory at the National Institute of Genetics in Japan and a professor on the paper. 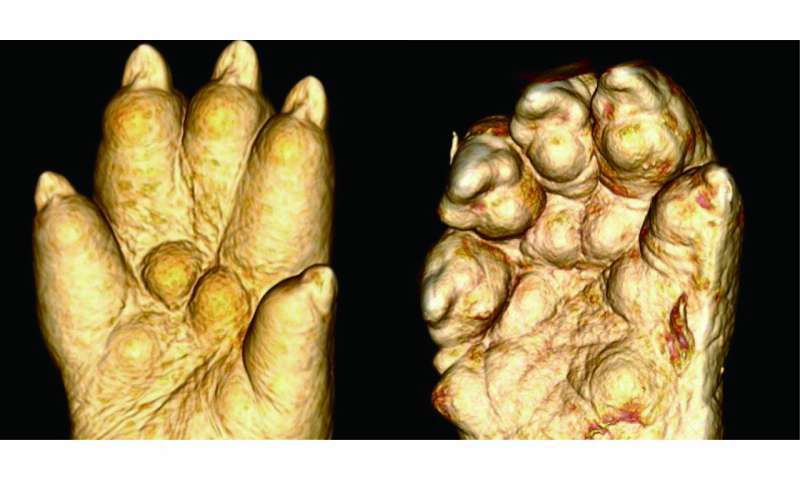 Shiroishi and his team examined a mutant mouse line, dubbed "Hammer toe," that appeared about 50 years ago. Instead of well-defined digits, mice in this line have webbed and sometimes fused toes. Previous studies demonstrate the appearance of many mutations resulted from the regulations of a protein named Sonic hedgehog, which is responsible for cell differentiation. Those analyses, according to Shiroishi, explain polydactylism—extra digits—but not the mutation appearing in Hammer toe mice. "Initially, we thought that might be the same type of mutation, and looked over the enhancer," Shiroishi said, referring to a snippet of DNA that helps proteins express certain physical characteristics. "But actually, the Hammer toe mutation is a large insertion between the enhancer and Sonic hedgehog." The researchers found a non-coding DNA fragment from chromosome 14 inserted into chromosome five, near the Sonic hedgehog gene. This difference in mutation types explains the unique feature of Hammer toe syndactylyism, as opposed to the mutations that result in polydactylism. "In the cell nucleus, a number of transcription factors interact with the genome to orchestrate gene expression," Shiroishi said. "The addition of new information means that the gene receives a new access point for transcription factors. If the transcription factor is an activator, it would raise expression levels of that gene." In the case of the Hammer toe line, the DNA fragment responds to the factors to induce Sonic hedgehog activity, which can turn off the protein responsible for inter-digital cell survival. The skeletal digits are already formed, so newly added Sonic hedgehog activity allows inter-digital cells to persist, changing the expected individual limbs into the webbed appearance. "Diversity of organ shape among vertebrate animals is controlled by differential gene regulation," said Shiroishi. "We provide unequivocal evidence that interchromosomal translocation is able to generate enhancer activity for a developmental gene, which ultimately leads to morphological alteration." This spontaneous mutation may have implications for understanding convergent evolution, according to Shiroishi. He points to the morphological similarity of webbed feet of frogs, water birds, and the capybara, a large rodent, as an example. He also notes the webbed appearance of bat wings, and how the genes in the Hammer toe mouse are also activated in the digits of developing bat wings. "During evolution, bats would have acquired regulatory information for genes specifically activated in wings," said Shiroishi. "We would like to identify convergence-related enhancers in animals, and clarify how regulatory evolution impacts morphological convergence."